Two limited edition Nintendo 3DS XLs were announced to launch alongside Pokemon X and Y this fall, The Pokemon Company announced at the Japan Expo in Paris today. 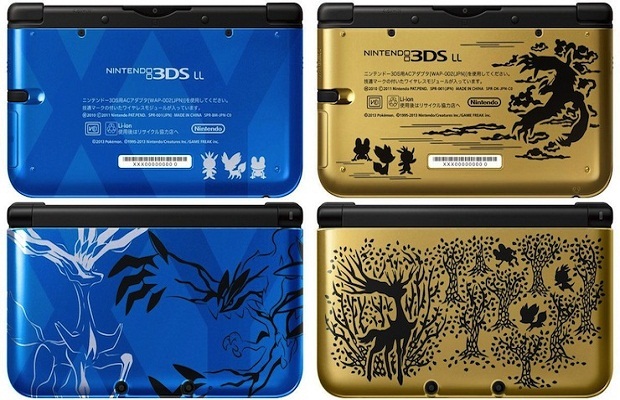 The two variations include a blue 3DS XL featuring new Pokemon Xerneas and Yveltal and the Premium Gold edition featuring silhouettes of the same Pokemon. All three new starter Pokemon can be seen on both editions. These limited edition 3DS XLs will be bundled with a digital copy of Pokemon X or Pokemon Y, stored on a 4GB SD card. They will retail at ¥22,000 (around $219). The Premium Gold edition will only be available at Pokemon Center stores. No word on these coming stateside. Pokemon X and Pokemon Y launch worldwide on October 12. Will you be picking it up? Follow us on Twitter and like us on Facebook to let us know.